The 2017 Airline Economics Conference is taking place in Dublin’s Shelbourne Hotel this week and is attended by airlines from across the globe with specific interest in finance and leasing. The theme of the conference is Growth Frontiers, a name perfectly suited to our client Goshawk who themselves have undergone significant growth since their inception only 18 months ago. 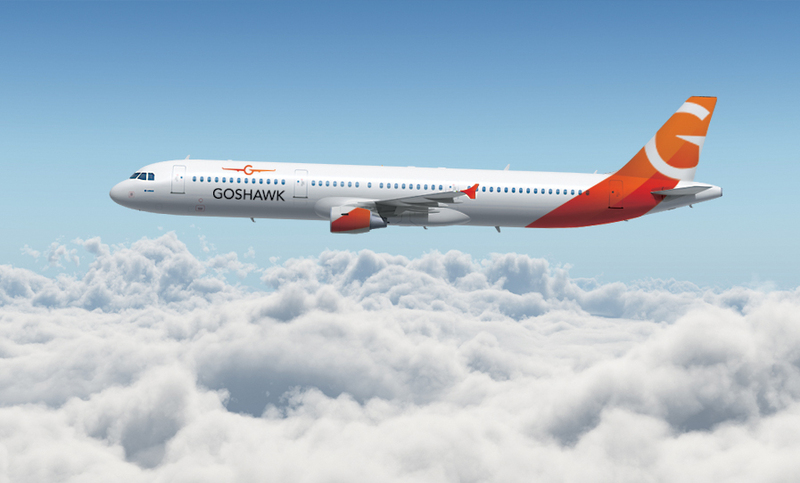 We were appointed as brand partners to Goshawk, an aircraft leasing company, with the focus of rebranding this young, but highly experienced team of aviation experts. In a short amount of time the company a committed portfolio of 89 aircraft with an attributable value of approximately US$4.4bn. Achieving these numbers in this short amount of time is reflective of the high level of ambition within the company. Our creative solution for them had to be equally ambitious. Having reviewed their international peers, we identified a very conservative approach to brand and communications existed. Many employed the old trusted blue colour of financial institutions, however we wanted to reflect the passion and ambition within the company, therefore choosing a vibrant red to orange gradient as the primary colour palette. This bold gradient brings energy and dynamism to communications when used in combination with the new photographic style. Black and white images of open skies and horizons reflect the Goshawk approach of looking at things differently than their competitors while the use of a handwritten font reflects the personality of the company.